The standard set by the expert florists at Stonehaven Flowers is of the highest possible. Our expert Stonehaven florists know exactly how to please and with our simply stunning collection of pink flower arrangements available, Stonehaven flowers know you will not be disappointed. Large-headed pink roses, gorgeous pink lilies or fabulous pink gerbera are amongst the many striking pink flowers available from Stonehaven Florists. Gorgeous flowers make any bouquet extra special and with the beautiful shades of pink colour, it creates the perfect feminine gift. The true beauty of these bouquets are evident to see and would be certain to make anyone delighted to receive them. Accompanied by colours of fresh white flowers and hand-tied with a selection of foliage’s, these bouquets are a classic gift guaranteed to please. Whether it be a congratulations or a simple thank-you, a striking bouquet of pink flowers from Stonehaven Flowers is the best option. All of our stunning hand-tied bouquets by our skilled Stonehaven florist are chosen with care. The florists at Stonehaven Flowers handle and arrange each bouquet with the love and attention they deserve. 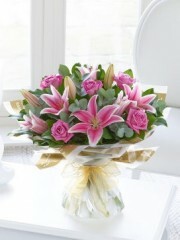 Stonehaven Florists assure you that they will produce a bouquet that will make an impact on any occasion. 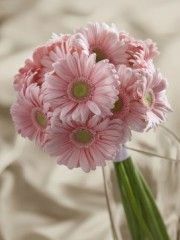 A pink flower bouquet is one of the most popular choices for the celebratory gift of a new baby girl. The fresh flowers and foliage’s displayed in attractive vase and gift box make the most delightful arrangement for new parents to enjoy. You can choose from numerous other gifts you may wish you include in your pink flower bouquet including a bottle of our extravagant champagnes, one of our vast selection of fine wines or an indulgent box of chocolates. Whichever you may choose, these accompaniments are sure to satisfy and truly creates the impression of a heart-felt gesture. At Florists Stonehaven the florists wish to please. Stonehaven Flowers hope that you or the loved ones you have in mind when you order enjoys one of our stunningly selected bouquets as much as possible. 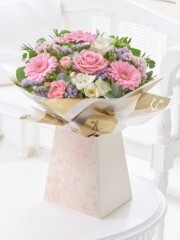 Our online store shows a huge collection of our pink flower bouquets on offer. If you would like to make your bouquet that little more personal for your loved one, you can let the expert Stonehaven florists know what style of bouquet you would like and which flowers you wish to include. Stonehaven flowers ensure that ordering with them is as easy as possible and take pleasure in creating a bespoke bouquet for you. With your convenience in mind, the Flower Delivery Stonehaven team offer you a wide selection of delivery options. Stonehaven flowers aim to please and therefore our Flower Delivery team offer a Same Day Delivery Service. As long as you place your order before 3pm you can be assured that our Stonehaven Flower Delivery will have your order delivered to your chosen destination. You can choose from a range of delivery times, from before 1pm to after 1pm at which ever suits you best. This way you can be assured that your special delivery is received by the one you have in mind at a time that it can be best appreciated. 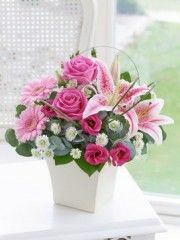 Stonehaven Flowers take complete pride and enjoyment from providing their customers with the finest, bespoke bouquets. These admirable pink flowers available from Stonehaven florists will not fail in bringing sheer happiness to you or a very special someone.